The Department of Plant Sciences started to function as a part of the Centre for Biosciences in 2009 and became independent Centre in 2015. In 2017 the nomenclature was changed and centre was replaced with Department. Our department aims to achieve excellence in research and teaching in the areas at the interface of basic and applied plant sciences. Five independent research groups combine to give a total of ~23 Ph.D., ~36 postgraduates and ~3 technical staffs. This department provides excellent research and training opportunities for Ph.D. and postgraduate students. A total of five students have completed their Ph.D. degree requirements. 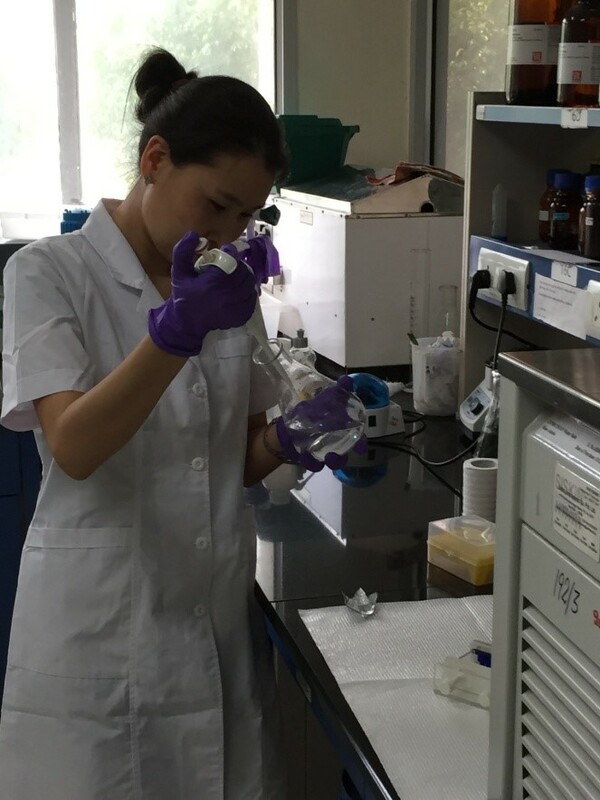 Currently, research in the department is focused on Plant Cell and Tissue Culture, Genome editing, Molecular Stress Physiology, Plant and Algal Biodiversity, Floristic Diversity of Antarctica, Anticancer compounds from algae and fungi, Genetics and Applied Genomics, and Plant Metabolic Engineering. This department is committed to expand its range of activities in coming days with new projects and manpowers. In a short span of its existence, the department has obtained grants of over 2.4 crores from external funding agencies. The department has well equipped laboratories with plant growth chamber, culture room, growth rooms for designing wide range of experiments and offers an excellent research environment in both fundamental and applied aspects of plant molecular sciences. Role of miRNA in Circadian rhythms. 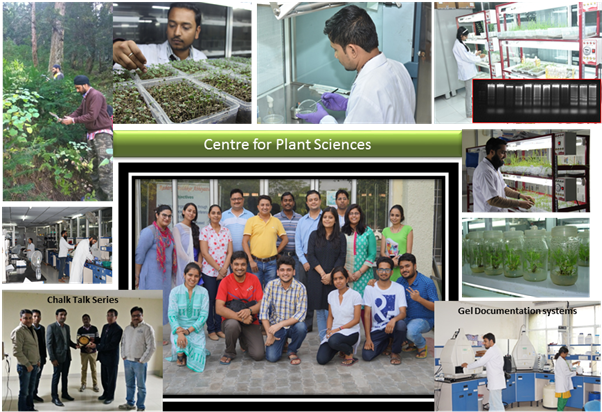 Centre for Plant Sciences equipped with state-of-the-art scientific laboratories. The common facilities include Confocal Microscope, Scanning Electron Microscope, and Automated DNA Sequencer. Anand, S.S., Thakur, S., Gargi, M., Choudhary, S., Bhardwaj, P. (2017). Development and characterization of genomic microsatellite markers in Prosopis cineraria. Current Plant Biology 9-10, 37-42. Garg, R., Singh, V., Mohan, R., Kumar, V., Jain, M. (2017). Global transcriptome and co-expression network analyses reveal cultivar-specific molecular signatures associated with seed development and seed size/weight determination in chickpea. The Plant Journaldoi: 10.1111/tpj.13621. Joshi, R., Rana, A., Kumar, V., Kumar, D., Padwad, Y.S., Yadav, S.K., Gulati, A. (2017). Anthocyanin enriched purple tea exhibits antioxidants, immuno-stimulatory and anticancer activities. Journal of Food Science & Technologydoi: 10.1007/s13197-017-2631-7. Kumar V, Yadav S. K. (2017). Transgenic tobacco overexpressing dihydroflavonol reductase and anthocyanidin reductaseshowed improved flavan-3-ols contents and tolerance against biotic and abiotic stress conditions. 3Biotech 7, 1-14. Bast, F. (2016) Primary succession recapitulates phylogeny. Journal of Phylogenetics and Evolutionary Biology, 4 (1). Bast, F. (2016). Left-Right Political Spectrum and the Human Gene Pool. Journal of Phylogenetics and Evolutionary Biology, 4(2). Thakur, S., Choudhary, S., Singh, A., Ahmad, K., Sharma, G., Majeed, A., Bhardwaj, P. (2016). Genetic diversity and population structure of Melia azedarach in North-Western Plains of India. Trees- Structure and Function, 30:1483–1494. Gill, B.S., and Kumar, S. (2015). Differential Algorithms assisted Molecular Modelling based Identification of Mechanistic Binding of Ganoderic Acids. Medicinal Chemistry Research doi: 10.1007/s00044-015-1405-x. Choudhary, K.K, and Agrawal, S.B. (2017). Effect of UV-B radiation on leguminous plants. In: E. Lichtfouse (Ed.) Sustainable Agricultural Reviews (pp. 115-162). Springer, Springer International Publishing Switzerland. Choudhary, K.K., Chaudhary, N., Agrawal, S.B., Agrawal, M. (2017). Reactive oxygen species: generation, damage and quenching in plants during stress. In V. P. Singh, S. Singh, D. K. Tripathi, S. M. Prasad, D. K. Chauhan (Eds.) Revisiting the Role of Reactive Oxygen Species (ROS) in Plants: ROS Boon or Bane for Plants? (pp. 85-115). John Wiley & Sons Limited, Chichester, West Sussex, UK. Rehman, W.U., Majeed, A., Rani, P., Saini, K.C., Najar, R., Mehra, R., Singh, A., Bast, F. (2016). Carrageenan based hydrogels and composites: A systematic investigation reporting their multidimentional essence. In: Natural Polymers: Derivatives, Blends and Composites, Edition: Volume I, Chapter: 3, Publisher: Nova Science Publishers, Editors: Saiqa Ikram and Shakeel Ahmed, pp.65-80. Yadav, R., Juneja, S., Singh, P. and Kumar, S. (2017). Drought and Heat Tolerance in Chickpea: Transcriptome and Morpho-Physiological Changes Under Individual and Combined Stress. In: Plant Tolerance To Individual And Concurrent Stresses' Ed. Senthil-Kumar Muthappa. 91-109 Springer, Springer International Publishing Switzerland. Singh, P., Bast, F., Kumar, S., and Saini, K.C. (2017) Influence of Insulin and Metformin on Prostate Cancer. In book: Horizons in Cancer Research., Editors: Hiroto S. Watanabe Vol. 64 pp 1-10 Nova Science Publishers. Bast, F. “Lichen Photobiont Diversity: Current State of the Art and Challenges”. Invited Talk at National Conference on Current developments and Next Generation Lichenology, CSIR-NBRI, Lucknow 27-28 January 2018. Bhardwaj, P., Chuadhary, S. Thakur, S. (2017). Transcriptome Characterization of Himalayan Rhododendron arboreum. Young Investigators Meet, India Biosciences, Dept. of Biotechnology, Govt of India, 6th- 9th March Goa. Dr. Felix Bast, Chemical and phylogenetic diversity of seaweeds in Indian sub-continent. Funding agency: Department of Science Technology; Sanctioned amount: 35 Lacs (INR). Dr. Felix Bast, Tracing evolutionary heritage of Indian languages using computational phylogenetics. Funding agency: Indian Council of Social Science Research, Sanctioned amount: 07 Lacs (INR). Dr. Krishna Kumar Choudhary, Response of Tropical mung bean (Vigna radiata L.) cultivars to foliar spray of ascorbic acid against salinity stress. Funding agency: Central University of Punjab, Sanctioned amount: 03 Lacs (INR). Dr. Pankaj Bhardwaj, Transcriptomic investigations of active gene networks in hyper-accumulator plant species in response to heavy metal toxicity. Funding agency: Council of Scientific & Industrial Research, Sanctioned amount: 20 Lacs. Dr. Pankaj Bhardwaj, Genetic diversity assessment of highly endangered species Taxus wallichiana and Ulmus wallichiana by DNA markers and geospatial technologies for effective conservation strategies. Funding Agency: Ministry of Environment, Forest and Climate Change, Sanctioned Amount: 35 Lacs. Dr. Sanjeev Kumar, Identification and characterization of stress proteins and related Heat Shock Factors; assessment of up/down-regulated stress genes in preconditioned chickpea (Cicer arietinum L.). Funding agency: Central University of Punjab, Sanctioned amount: 03 Lacs (INR). Dr. Pankaj Bhardwaj, Analyses of genetic variations and structure of Rhododendron, a rare and endangered tree species in Western Himalayas. Funding agency: University of Grant Commission, Sanctioned amount: 06 Lacs (INR). Dr. Felix Bast, Sequence-based DNA barcoding, Phylogeography and Conservation Genetics of selected Medicinal Plants from Indian Subcontinent. Funding agency: Central University of Punjab, 03 Lacs (INR). Dr. Felix Bast, Tracing evolutionary heritage of Indian Languages using Computational Phylogenetics. Funding agency: ICSSR, 07 Lacs (INR). Dr. Pankaj Bhardwaj, Analyses of genetic variations and structure of Rhododendron, a rare and endangered tree species in Western Himalayas. Funding agency: Department of Science Technology, Sanctioned amount: 17 Lacs (INR). Dr. Pankaj Bhardwaj, Differential gene expression in response to ultra-low temperature in Rhododendron arboreum by whole genome transcriptome. Funding agency: Central University of Punjab, Sanctioned amount: 03 Lacs. Dr. Felix Bast, Genotoxicity detection in drinking water from Malwa region, Punjab. Funding agency: University of Grant Commission, Sanctioned amount: 06 Lacs (INR). Dr. Sanjeev Kumar, Investigating the mechanism associated with temperature stress tolerance imposed by non-lethal stress conditions; Understanding metabolic relationship between cold and draught x heat stress in chickpea (Cicer arietinumL.) Funding agency: University of Grant Commission, Sanctioned amount: 06 Lacs (INR). Mehra, R. 2016. Barcoding and Molecular Phylogeny of the Genus Caulerpa (J V Lamouroux) inferred from ITS rDNA, tufA, rbcL and rps markers" at Asia Pacific Conference on Algal Biotechnology held at Bangkok Thailand. Mehra, R. (2016). Received DBT-CTEP travel grant to attend the conference at Bangkok Thailand. Komal Mansotra and Anish Gupta, M.Sc. Students, participated in National Level Debate competition (Jammu University). 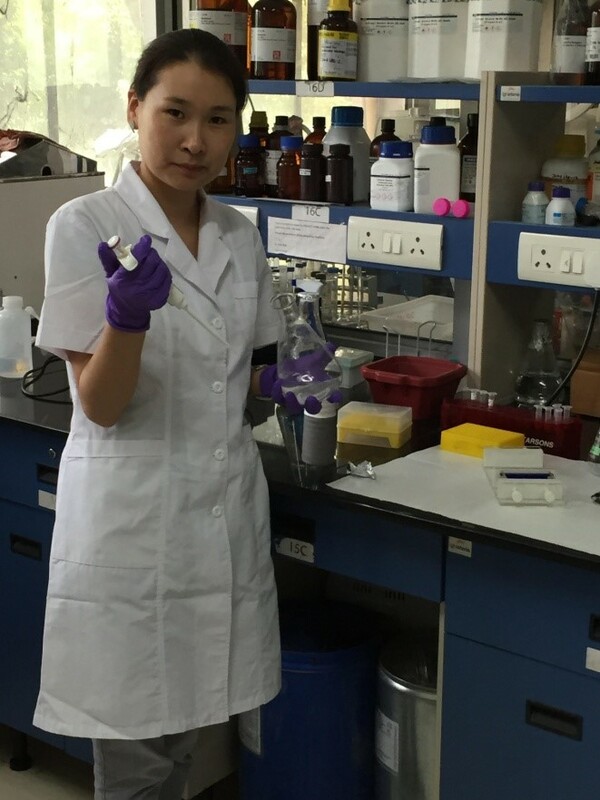 Institute of General and Experimental Biology, Mongolian Academy of Sciences, Mongolia is visiting the Centre in NAM S&T Centre Research Training Fellowship for Developing Country Scientists (RTF-DCS) (2016-17). Plant Sciences is equipped with state-of-the-art scientific laboratories. The common facilities include Confocal Microscope, Scanning Electron Microscope, and Automated DNA Sequencer.